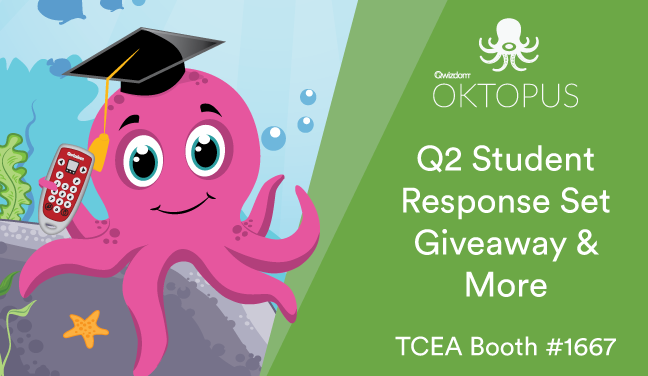 The 2019 Q2 SRS Giveaway (“Contest”) is open only to legal residents of the fifty (50) United States and the District of Columbia who are seventeen (17) years of age or older and are actively employed as a K-12 classroom educator. Employees, officers and directors of Qwizdom Incorporated, Boxlight, and Mimio, as well as the immediate family (defined as parents, spouse, children, siblings and grandparents) and household members of each such employee, officer and director are not eligible to enter. Any person who has been awarded a prize or reward from participation in a Qwizdom sponsored promotion in the past 18 months are not eligible to enter. All federal, state and local laws and regulations apply. By participating in the Contest, entrant fully and unconditionally agrees to and accepts these Official Rules and the decisions of Qwizdom Inc., which are final and binding. Void outside of the U.S. and where prohibited by law. The Contest period begins on February 5 at 12:00 AM CST and will end on February 7, 2019 at 5:00 PM CST. The selections for the contest award will take place on or about February 11th, 2019. Qwizdom Inc. (a Boxlight company) will announce the Winner on or about February 11, 2019 on the Site and attempt to notify individual entrants/registrants via e-mail and/or telephone (at Qwizdom Inc. discretion and using the information provided). If a Winner cannot be contacted within seven (7) days after the first attempt to contact him/her, another Winner will be selected in his/her place at random from among all eligible entrants/registrants. Potential winner must comply with all terms and conditions of these Terms and Conditions and winning is contingent upon fulfilling all requirements. Acceptance of any prize shall constitute the Winner’s consent to Qwizdom Inc. (a Boxlight company) use of the Winner’s name, likeness, voice, opinions, prize information and hometown and state for promotional purposes in any media, worldwide, without limitation and without further payment or consideration, except where prohibited by law. By participating in the Contest, entrants agree to release and hold harmless Qwizdom Inc., its officers, directors, employees, affiliated companies and agents (collectively, the “Released Parties”) from and against any claim or cause of action arising out of participation in the Contest or receipt or use of any prize, including, but not limited to: (a) unauthorized human intervention in the Contest; (b) technical errors related to computers, servers, providers or telephone or network lines; (c) printing errors; (d) errors in the administration of the Contest or the processing of entries; or (e) injury or damage to persons or property which may be caused, directly or indirectly, in whole or in part, from entrant’s participation in the Contest or receipt of any prize, including but not limited to property damage, personal injury and/or death arising out of participating in this Contest, or the acceptance, possession, use or misuse of prize and claims based on publicity rights, defamation or invasion of privacy. Entrant further agrees that in any cause of action, the Released Parties’ liability will be limited to the cost of entering the Contest, and in no event shall the Released Parties be liable for attorneys’ fees. Entrant waives the right to claim any damages whatsoever, including, but not limited to, punitive, consequential, direct or indirect damages. Except where prohibited, entrant agrees that any and all disputes, claims and causes of action arising out of or connected with this Contest or any prize awarded shall be resolved under the laws of the State of Washington, without respect to any conflict of law issues, and entrant agrees that such shall be resolved individually, without resort to any form of class action, and exclusively by the U.S. Federal and State Courts of Washington. If for any reason an entrant’s entry is confirmed to have been erroneously deleted, lost or otherwise destroyed or corrupted, entrant’s sole remedy is another entry (comment) in the Contest. Qwizdom Inc. reserves the right to cancel, suspend and/or modify the Contest if any fraud, technical failures or any other factor beyond Sponsor’s reasonable control impairs the integrity or proper functioning of the Contest, as determined by Sponsor in its sole discretion. Sponsor reserves the right in its sole discretion to disqualify any person it finds to be tampering with the entry process or the operation of the Contest or to be acting in violation of these Official Rules or in a disruptive manner. Sponsor’s failure to enforce any term of these Official Rules shall not constitute a waiver of that or of any other provision. Do I need to provide testimonials about the Qwizdom products I win? Yes, but it will be pain-free! We will send you questionnaires for you to complete asking a few questions about how you’ve used Qwizdom. Ideally, we want to improve our product with your help. Ultimately, we want to build a great relationship with you! About how long will I be asked to complete questionnaires? We anticipate that this should take a maximum of six months, but you are welcome to communicate your thoughts about Qwizdom products afterwards. We are interested in knowing how you will plan to use Qwizdom in the new school year (2019-2020) as well. For sure! We want to make sure that you feel confident about using our products. Qwizdom is a teacher and student friendly set of tools, so set up and use should be fairly simple. We also have fantastic quick start guides and helpful videos on your YouTube channel – Qwizdom, Inc.
Can I provide testimonials in the forms of video and photos? Yes, you can! If you decide to include any of your students, we’ll need to get release forms completed. Congratulations! We look forward to collaborating with you!